How Do You Divide Mixed Numbers? 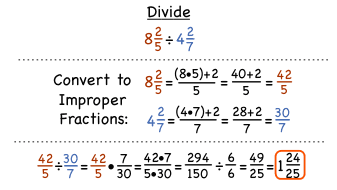 To divide mixed fractions, you could first convert each to an improper fraction. Then, switch to a multiplication problem by multiply by the reciprocal of the divisor. Simplify and convert your answer back to a mixed fraction to get your answer! This tutorial will show you how! How Do You Know if a Number is Divisible by 2, 3, 5, 6, or 10? Learning about divisibility? Then you should check out this tutorial! You'll learn some neat rules for figuring out if a number is divisible by 2, 3, 5, 6, and 10. Take a look; you'll be glad you did! How Do You Multiply Mixed Numbers? To multiply mixed fractions together, you could first convert each to an improper fraction. Then, multiply the fractions together, simplify, and convert your answer back to a mixed fraction. This tutorial will show you how!